Here’s to Friday almost being here! Naturally I’m ready after another busy week at work and feeling rushed to cram everything I wanted to do in. I think this week’s stress resulted in an odd dinner craving tonight, especially after a few nights of cold salads. 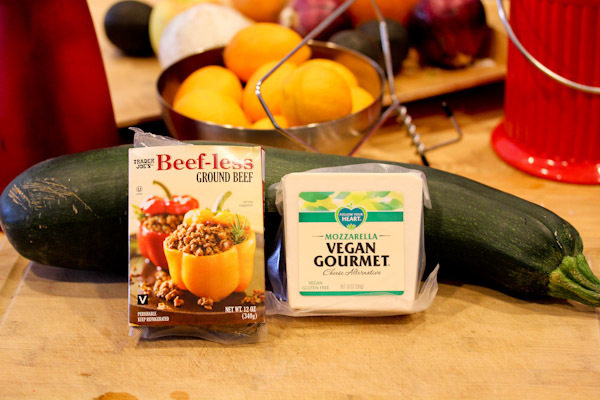 I decided to try a vegan lasagna using a mutant zucchini from a friend’s garden, Trader Joe’s Beef-less vegan alternative, and Follow Your Heart Vegan Gourmet Mozzarella. I rarely buy vegan meat alternative products like this, but they’re great for quick meals I can share with my non-vegan hubby. And a pretty good source of protein and vitamins. 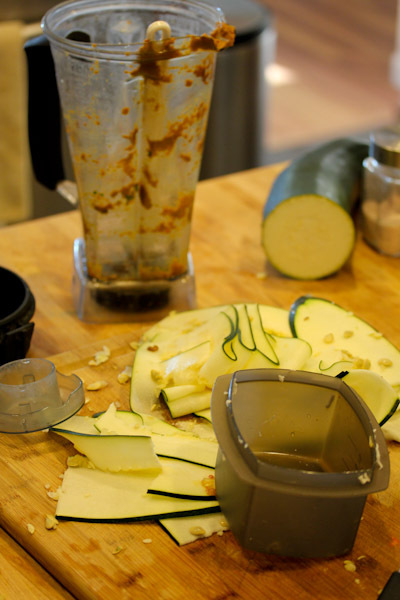 The zucchini was so huge that I had to lug out my monster Oxo Mandoline Slicer to turn it into lasagna noodles. 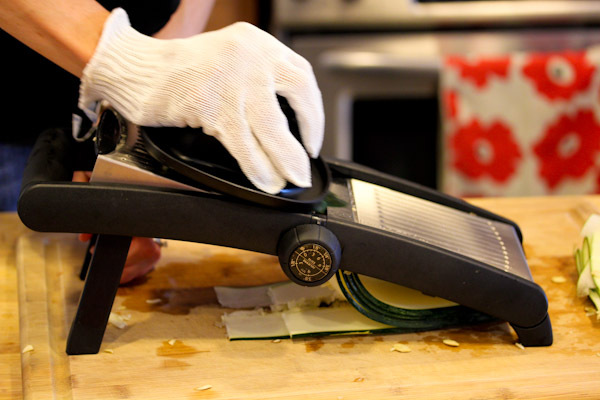 Using it still makes me a little nervous I might slice a finger off, so I use a cutting glove with it. 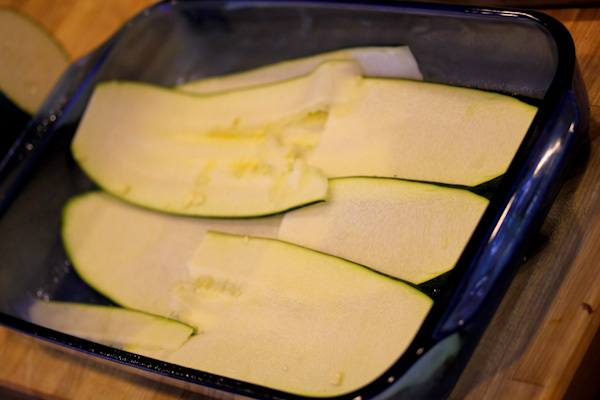 I laid out the zucchini slices in a greased baking dish. And put hubby to work layering the vegan “beef” and mozzarella shreds. I decided it needed a red sauce too and improvised a marinara sauce in the Vita-Mix using a carrot, red pepper, fresh basil, lemon juice, garlic, oregano, sun dried tomatoes, and some cherry tomatoes I swiped from our garden. The color kind of looked like baby food or worse, but it was tasty. 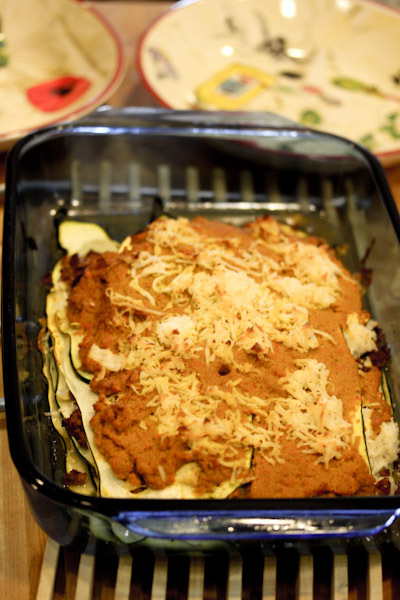 We topped the lasagna with the sauce and more shredded vegan mozzarella. Then baked it at 350 degrees for about 30 minutes, giving me time to clean up the mess I made! 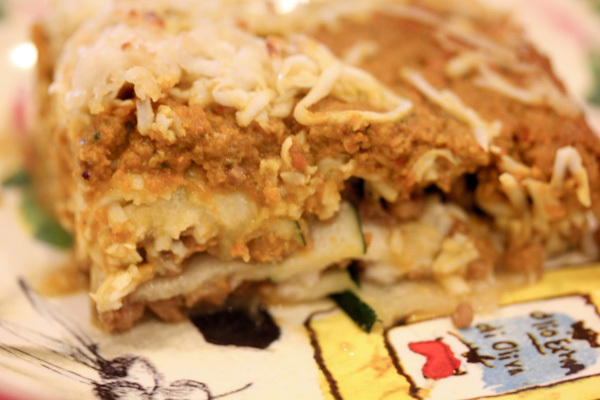 I still have tons of left over zucchini slices, enough to make a few more lasagnas! The finished product looked and smelled wonderful. The vegan mozzarella didn’t melt that well, but it took on a tasty and crispy texture. Slicing and serving was a little messy, but still made a pretty presentation looking something like actual lasagna. And it didn’t get too moist or mushy from cooking. Both hubby and I really like this dish cleaning our plates, I love when we can successfully pull off a vegan dish he likes too. Next time I might bake it a little longer to soften the zucchini slices more and use a more traditional tomato sauce, but it was still wonderful. 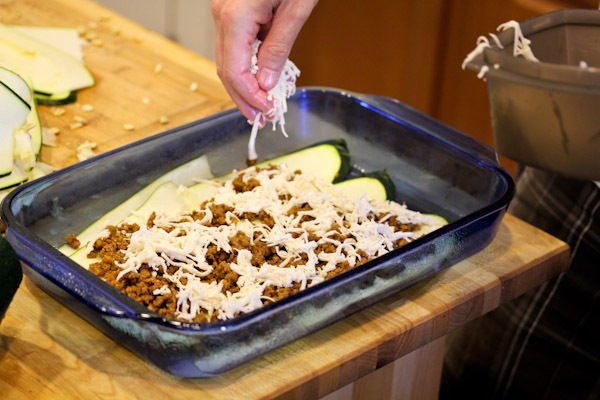 Zucchini makes a great, low-carb alternative to lasagna noodles that holds up well to baking. 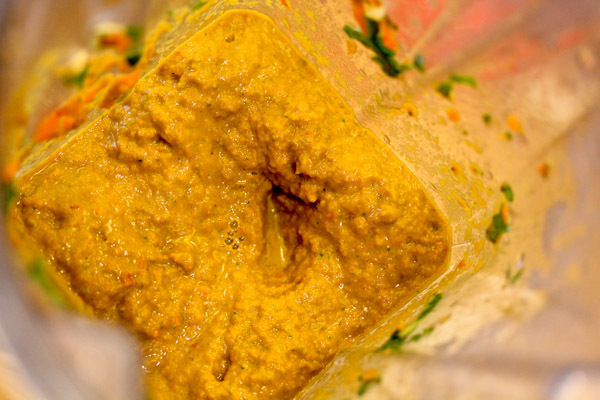 And I have plenty of tasty leftovers for lunch tomorrow – yum! Also, if you have Netflix, Forks Over Knives is available over live streaming! For a documentary, it’s very well done and I really enjoyed seeing it in theaters a few months ago and am looking forward to watching it again. This looks yummy. As someone who absolutely *loves* salad, there are still times when I just can’t face another one, so I totally understand your craving for something like this! This looks great! 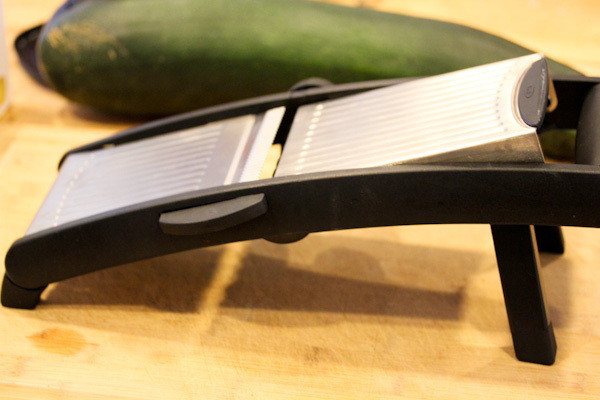 A mandolin slicer is still on my list of kitchen gadget “need to get” tools. Hi Christine! How are you??? 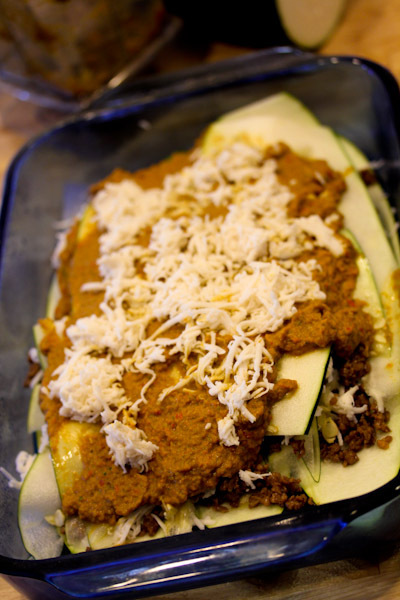 love that you used the zucchini as lasagna noodles. 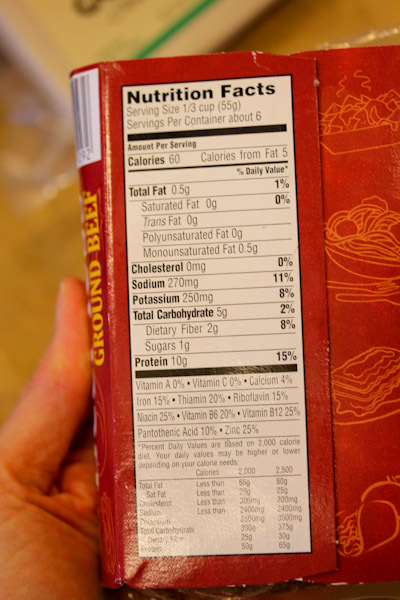 And I haven’t seen that “meat” at Trader Joe’s but it looks pretty good, I’ll have to check it out. I have a mandolin that ive used precisely once b/c i DID almost take off a thumb. Seriously bad laceration and have put it on the shelf…indefinitely. Great job on the vegan lasagna! Yessss! 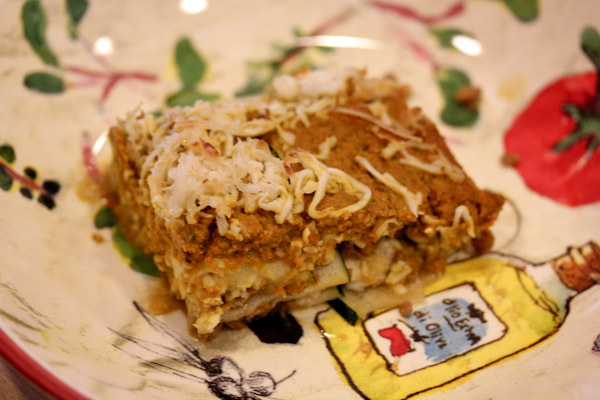 I adore lasagna so this recipe makes me so happy! 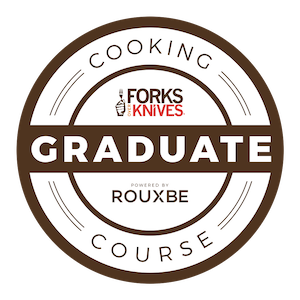 And I’ve been waiting eagerly for Forks Over Knives to be available. 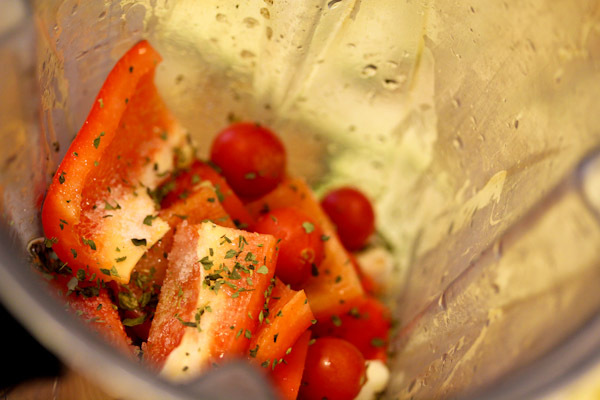 Cravings are good to feed into sometimes, and a nice healthier version of a classic can hit the spot. yes we caught forks over knives last weekend on netflix! i agree with you i rarely buy meet alternatives but sometimes it is a nice change. hope you are having a good weekend christine!